CUG-BP1 human nuclear RNA binding protein. Our Abpromise guarantee covers the use of ab9549 in the following tested applications. IHC-FoFr: Use at a concentration of 2 µg/ml. WB: 1/500. Detects a band of approximately 50 kDa in HeLa lysates(predicted molecular weight: 54 kDa). RNA-binding protein implicated in the regulation of several post-transcriptional events. Involved in pre-mRNA alternative splicing, mRNA translation and stability. Mediates exon inclusion and/or exclusion in pre-mRNA that are subject to tissue-specific and developmentally regulated alternative splicing. Specifically activates exon 5 inclusion of cardiac isoforms of TNNT2 during heart remodeling at the juvenile to adult transition. Acts as both an activator and repressor of a pair of coregulated exons: promotes inclusion of the smooth muscle (SM) exon but exclusion of the non-muscle (NM) exon in actinin pre-mRNAs. Activates SM exon 5 inclusion by antagonizing the repressive effect of PTB. Promotes exclusion of exon 11 of the INSR pre-mRNA. Inhibits, together with HNRNPH1, insulin receptor (IR) pre-mRNA exon 11 inclusion in myoblast. Increases translation and controls the choice of translation initiation codon of CEBPB mRNA. Increases mRNA translation of CEBPB in aging liver (By similarity). Increases translation of CDKN1A mRNA by antagonizing the repressive effect of CALR3. Mediates rapid cytoplasmic mRNA deadenylation. Recruits the deadenylase PARN to the poly(A) tail of EDEN-containing mRNAs to promote their deadenylation. Required for completion of spermatogenesis (By similarity). Binds to (CUG)n triplet repeats in the 3'-UTR of transcripts such as DMPK and to Bruno response elements (BREs). Binds to muscle-specific splicing enhancer (MSE) intronic sites flanking the alternative exon 5 of TNNT2 pre-mRNA. Binds to AU-rich sequences (AREs or EDEN-like) localized in the 3'-UTR of JUN and FOS mRNAs. Binds to the IR RNA. Binds to the 5'-region of CDKN1A and CEBPB mRNAs. Binds with the 5'-region of CEBPB mRNA in aging liver. Belongs to the CELF/BRUNOL family. Contains 3 RRM (RNA recognition motif) domains. Phosphorylated. Its phosphorylation status increases in senescent cells. Nucleus. Cytoplasm. RNA-binding activity is detected in both nuclear and cytoplasmic compartments. ab9549 stained MCF7 cells. The cells were 100% methanol fixed for 5 minutes at -20°C and then incubated in 1%BSA / 10% normal goat serum / 0.3M glycine in 0.1% PBS-Tween for 1hour at room temperature to permeabilise the cells and block non-specific protein-protein interactions. 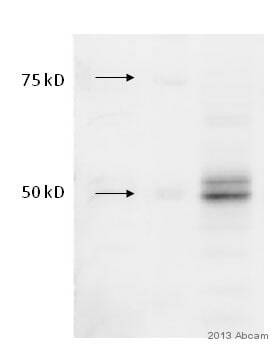 The cells were then incubated with the antibody (ab9549 at 10µg/ml) overnight at +4°C. The secondary antibody (pseudo-colored green) was Goat Anti-Mouse IgG H&L (Alexa Fluor® 488) preadsorbed (ab150117) used at a 1/1000 dilution for 1hour at room temperature. Alexa Fluor® 594 WGA was used to label plasma membranes (pseudo-colored red) at a 1/200 dilution for 1hour at room temperature. DAPI was used to stain the cell nuclei (pseudo-colored blue) at a concentration of 1.43µM for 1hour at room temperature. IHC image of CUG-BP1 staining in human normal kidney formalin fixed paraffin embedded tissue section*, performed on a Leica Bond™ system using the standard protocol F. The section was pre-treated using heat mediated antigen retrieval with sodium citrate buffer (pH6, epitope retrieval solution 1) for 20 mins. The section was then incubated with ab9549, 5µg/ml, for 15 mins at room temperature and detected using an HRP conjugated compact polymer system. DAB was used as the chromogen. The section was then counterstained with haematoxylin and mounted with DPX. Publishing research using ab9549? Please let us know so that we can cite the reference in this datasheet.